Black, leather, lace, distressed denim, faux fur, leopard, studs, sequins, chains, oversized accessories, boots and stacked heels; Rock Chic. Done well, it’s timeless. It’s effortless cool. It’s my favourite way to dress. Erin Wasson in leather and studs, my ultimate girl crush. Photo: Natasha's Soiree. Emanuelle Alt of Vogue Paris does French chic in leather skinnies. Lily Donaldson dons pleather, fur and kickass boots for British Vogue's "Brilliantly British". Emilio Pucci Cutout Studded Leather Sandals. Love. Jessica Szohr does downtown cool in distressed denim. Natasha Poly for Balmain SS09. I heart Rihanna's leather. Photo: Just Jared. Ashley & Mary-Kate Olsen. Hot boots. Abbey Lee for Moussy SS10. Photo: Cool Kids Can't Die. 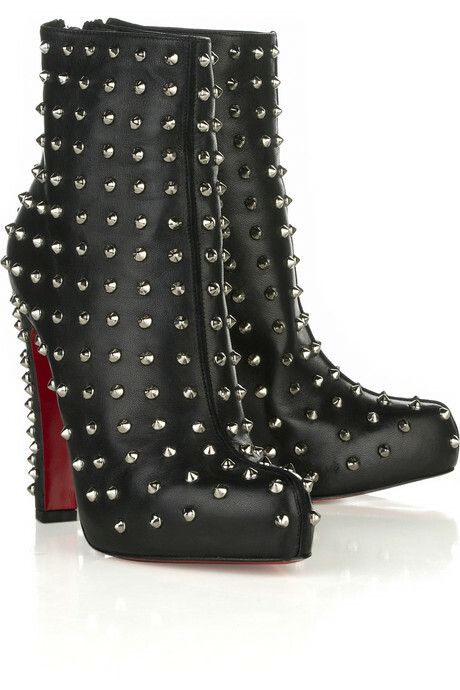 Christian Louboutin "Ariella" studded boots. My absolute favourite boot from the past couple of seasons. One Teaspoon do the BEST shorts; the Trashwhores and Bonitas. Photo: Cool Kids Can't Die. Taylor Momsen; rarely seen without leather or coffee. Olivia Palermo. The City ice queen looks hot in a leather corset. Blake Lively, leather and lace. Photo: Take the Money and Run. The definition of Shoe Lust. ~ by threadlust on August 16, 2010.